NETWORK UPDATE: As expected, FOOD FIGHTERS and AMERICA’S GOT TALENT exchanged 0.1s in final network numbers. EXTREME WEIGHT LOSS and 20/20 each gained 0.1. In addition, the FAMILY GUY rerun rose 0.1 and the SUPERNATURAL rerun dropped by the same. Below are the ratings in several demographic categories for the Top 25 original cable telecasts last night, along with a few additional titles of interest. If there are other series you’d like included, please let us know. Although RIZZOLI & ISLES (TNT) and PRETTY LITTLE LIARS (ABCFamily) topped the chart, they were both down significantly from last week in 18-49s, RIZZOLI down almost two tenths to 0.83, and LIARS down nearly as much to 0.73. The RIZZOLI drop didn’t help its companion show PERCEPTION, which fell 0.14 to 0.46. The newly-renewed FINDING CARTER (MTV), not its season finale as I had erroneously written yesterday, rose 0.04 to 0.44. 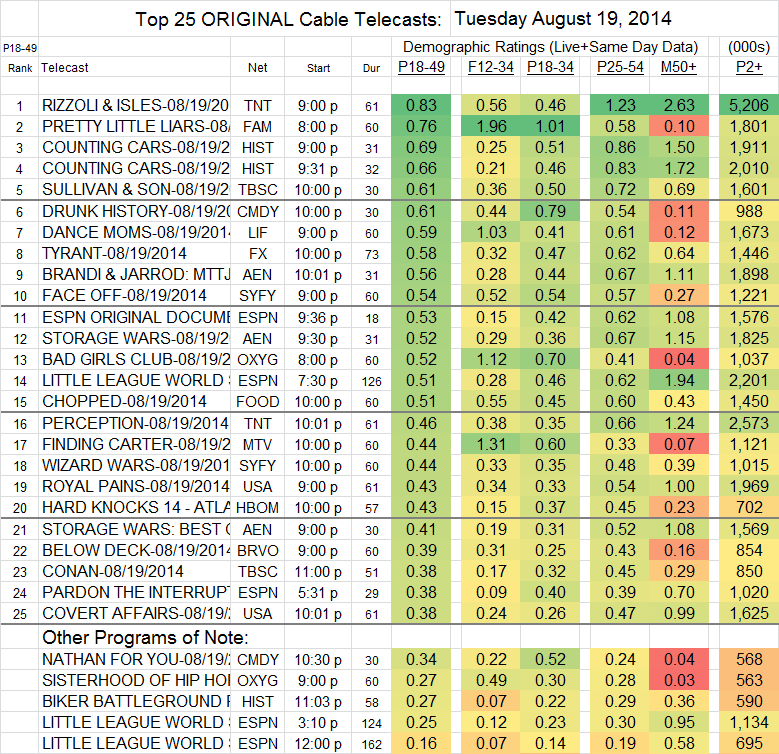 On USA, ROYAL PAINS lost half a tenth to 0.43, but COVERT AFFAIRS got a much-needed rise, up 0.04 to 0.38. TYRANT (FX) was steady at 0.59. Both of Comedy Central’s shows were up, DRUNK HISTORY by half a tenth to 0.56, and NATHAN FOR YOU by 0.08 to 0.34. On the unscripted side, COUNTING CARS (History) was down more than a half a tenth to 0.69/0.66. DANCE MOMS (Lifetime) held close to last week at 0.59, and FACE OFF (Syfy) was at 0.54. HARD KNOCKS (HBO) rose 0.03 to 0.43.